Peters, Jörg. 2017. 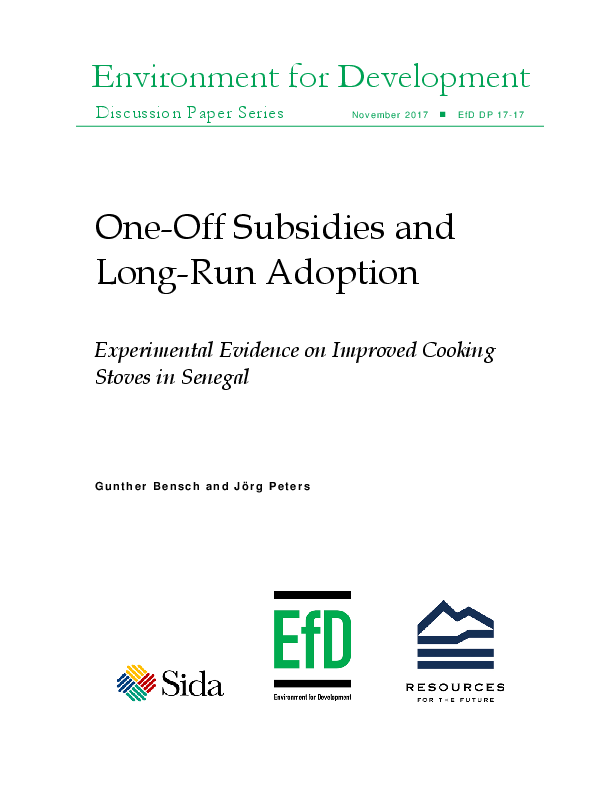 “One-Off Subsidies and Long-Run Adoption: Experimental Evidence on Improved Cooking Stoves in Senegal.” EfD Discussion Paper Series 17-17. Free technology distribution can be an effective development policy instrument if adoption is socially inefficient and hampered by affordability constraints. Yet, policy makers often oppose free distribution, arguing that reference dependence spoils the willingness to pay and thus market potentials in the long run. For improved cookstoves, this paper studies the willingness to pay six years after a randomized one-time free distribution. Using a real-purchase offer procedure, we find that households who received a free stove in the past do not reveal a lower willingness to pay to repurchase the stove. Furthermore, we provide exploratory evidence that learning and reference-dependence effects do not spill over from the treatment to the control group. The policy implication is that one-time free distribution does not disturb future market establishment and might even facilitate it.